It is common knowledge that injury rates in sports are reaching all-time highs. Below is a chart of statistics from a few years ago on the injury rates in multiple different high school sports. There are over 2.6 million children under the age of 19 that participate in sports each year. 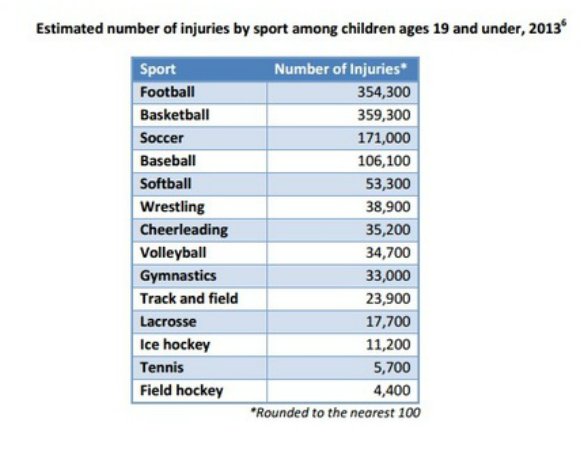 SO it is safe to say that injuries effect a significant amount of children that play sports in the United States. This is one of the main reasons Lewis Fitness & Performance was opened in early 2013 was to better prepare area athletes for the rigors of their sport(s) and do our part to decrease the likelihood of injury and help athletes enjoy their sport to the best of their ability. ​Despite our efforts, injuries will always occur in sports and this has lead to the creation of the Return to Competition Program here at LFP. This program is designed to add a traditionally missing element to the continuum of care, which is the performance element provided performance enhancement specialists. 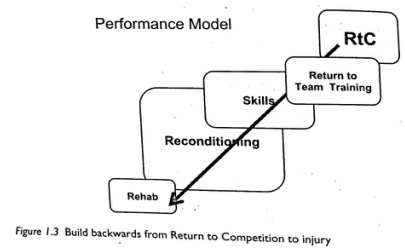 Traditional rehabilitation is limited in the depth and scope of the rehab professionals. As athletes progress in their recovery they quickly progress into a skill set that this program is designed to enhance and traditional rehabilitation settings are ill-equipped to enhance effectively. This creates a synergistic relationship between the performance team (doctors, physical therapist, and performance enhancement coaches) to help the athlete return to peak competition shape and reduce the likelihood of re-injury or a related injury due to compensation. Ultimately the need for a program such as this comes from my personal experience as an athlete. During my football career, like most, I dealt with my fair share of injuries. During my college football playing time I suffered a serious wrist injury that was not diagnosed until after my first full season at West Virginia University. It ultimately took me off the field for an entire season and luckily I had a great performance team to lean on for both my physical healing but also from a mental aspect. The strength & conditioning coaches helped me tremendously by focusing on what I COULD do and providing structure and accountability during the recovery process. These are goals of this program regardless of the injury there is a way to work around injury and rest is never the answer. For more information on the science of this program please take the time to read through the posts linked below. This will provide the full scientific background for how this program was developed.